Making crispy, blister-crusted pizza is nothing new in Seattle. I'd even make the claim that "chef-driven" pizza isn't remarkably groundbreaking, with Ethan Stowell delivering plenty of pies across his restaurants, as well as the recent opening of John Sundstrom's Southpaw rounding out the list. But when chef Brendan McGill opened Bruciato on Bainbridge Island at the end of January, it's possible that Seattle's best pizza finally arrived. In order to try it for yourself, you'll need to stop whatever you're doing, hop onto the next ferry, and get in line. To understand what makes his pizza worth a ferry ride (pro tip: walk on), you'll need to first hear the story of Brendan McGill. 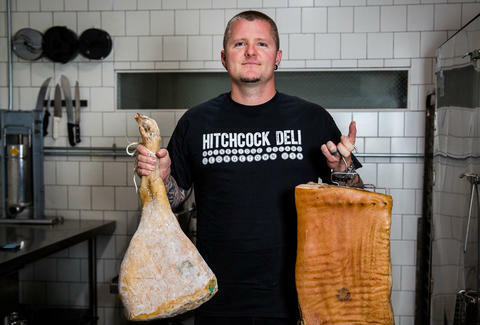 It began in 2010 with Hitchcock, his dinner-only restaurant on Bainbridge Island. From there, he opened a deli, a vegan restaurant called Verjus, and finally, Bruciato. McGill got into pizza after cutting his teeth in Naples, Italy. It was there he learned about sourcing while also cooking for free at the best pizzerias in the world. McGill found that hyperlocal, ingredient-focused food was the way to go and he brought that conviction back with him to Seattle. Then, chef Brendan McGill created an impenetrable food empire. When the doors first opened at Hitchcock, McGill was cooking gastropub-type fare. That eventually led him to dabble in the development of a tasting menu. "I was still becoming familiar with the intersection of seasonality and the hyperlocal goodies found on the island," the chef explains. "The island showed me who I was as a chef, helping me to present the truly seasonal products of Cascadia." Once a tasting menu was formulated, McGill started to garner proper attention with unique, hyper-specific dishes. 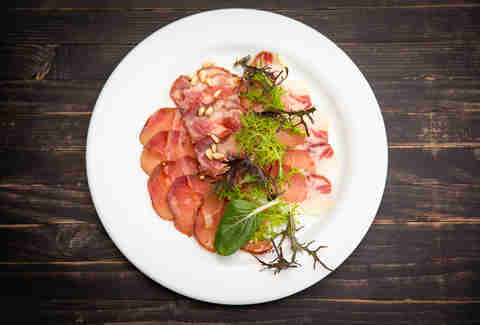 One such dish was a plate that featured rich-and-sweet deep meat made in the style of prosciutto from the leg of a breed of sheep called Soay, which was rediscovered in the 1700s in Scotland. The Soay McGill used was raised by a friend of a friend who recently culled his herd in favor of a more profitable crop… cannabis. This small-crop, connection-based community sourcing has become the norm for McGill and what makes his menus so unparalleled and intriguing. The tasting menu days were a turning point for McGill, as it showed him that the foods he made while in full experimentation mode were worth exploring and showcasing. But growth didn't come all at once, and the formative years were "nail biters" by the chef's account. However, the tiny island's community eventually accepted him, and slowly but surely, things finally started to come together, with visitors coming to Bainbridge expressly to eat McGill's cuisine. As Hitchcock was growing, McGill realized he needed more kitchen space than the restaurant could provide. "Our experiments with a caveman smoker by the window were straight-up dangerous," the chef remarks of the old setup. Luckily, over on Winslow Way, the island's main street, a large plaza was being built in front of the adjacent storefront next to Hitchcock. This was an opportune moment for McGill. Hitchcock Restaurant was closed during the day, as the space itself had more of a dim, dinner ambience (also, it required a large amount of labor to prep the restaurant for the 5pm dinner service). So this new storefront gave McGill an idea: Buy a space and create a top-notch lunch spot… and then call it Hitchcock Deli. Taking over the space next door allowed McGill to add room to butcher, cure, and store food, as well as smoke it. 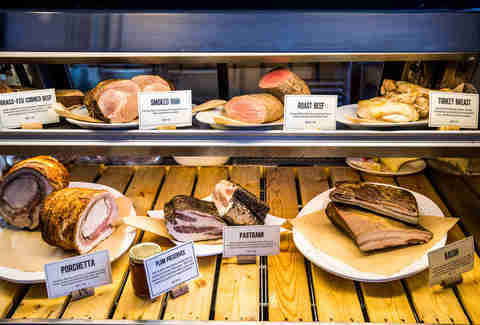 With the equipment in place to produce bacon, pastrami, and other meats each week, the team was able to create plenty of boutique charcuterie to supply the deli and the restaurant. The menu expanded with the addition of more varieties of meats and more sandwiches, and as an extra bonus, the deli became a hub for locals and visitors to hang during the day. With the deli operating at maximum efficiency, McGill turned his attention back to Hitchcock next door. It was time for pizza to make an appearance in his life -- and kitchen -- once again. As McGill's tasting menu was increasing in popularity throughout the community, he saw a parallel need for something slightly simpler: the perfect pizza, just like the ones he made while staging (read: interning) in Italy and cooking as executive chef for the Caffe Vita restaurant group. So he started a pop-up at Hitchcock on Monday nights called Bruciato -- named for the blistering crust created in a hot oven when dough enters. Meanwhile, his past in pies came back to him in another way. While in Italy, he helped Via Tribunali founder Mike McConnell bring the phenomenally tasty Solea tomatoes to the States. He first discovered the tomatoes and flour while on the line cooking up pizza during his staging stint. Later, he went to the source with McConnell. When Solea first arrived in Seattle in 2009, they were housed in Georgetown. However, it wasn't long before the tomatoes outgrew their allotted space and needed to find a new home within a couple years. This was an omen for McGill, who pounced on the opportunity to open a second deli in the summer of 2014. "I was drawn to the [Solea] space for years, and seeing the restaurants in the area doing well, and Georgetown taking shape, I wanted to expand my footprint back into Seattle," McGill says. Surprisingly, rent was non-astronomical, and the large space was ideal for his meat-making exploits. He could also finally add a butcher counter. The opportunity for honesty and sourcing in the meat-curing process appealed to him. 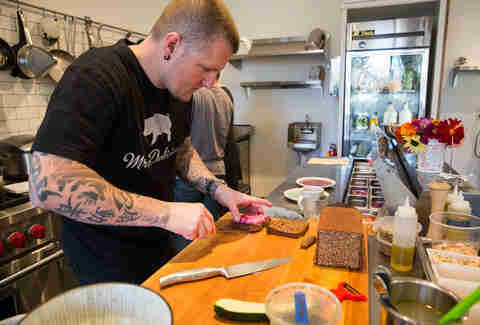 With Boar's Head and commodity meat making appearances at "gourmet" sandwich shops, he wanted to turn locally sourced, ethically processed meat into an everyday option. "If I'm going to make a difference in our world through food," he says, "it can't just be by offering bourgeois tasting menus. Every time someone chooses my delis for lunch, they displace that amount of commodity meat, and have a healthier and tastier lunch -- even if it costs a couple dollars more." His philosophy for sourcing is deeply ingrained in his restaurants, and much of the produce for his restaurants comes from his own Shady Acres Farm, or from other farmers on Bainbridge Island. 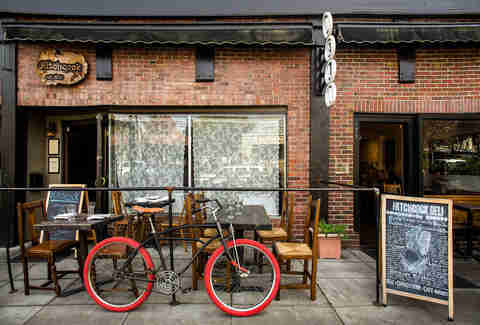 Now, with an upscale restaurant, two delis, a vegetarian lunch cafe he opened in 2016 called Verjus, and a recently announced third lunch location (in Downtown Seattle), McGill has finally opened a pizzeria. After months of stops and starts, the permitting process concluded and he got the go-ahead from the city to turn Bruciato into a fully functioning pizza restaurant with Italian dishes made from locally grown ingredients, in the heart of Bainbridge. The building is known on the island as The Old Hardware Store. It's been passed around in recent years, with a furnishing store taking hold, then a purchase by a controversial coffee shop, and most recently being put in the hands of a new owner, Jack Lacko, who promised to maintain the bones of the building. McGill gushes about the rafters and ceilings when he describes the 6,000sqft building, of which Bruciato is renting one-third of. Experienced Seattle pizzaiolo Brandon Thompson is stepping up as the master of the Stefano Ferrara oven, which is made in Naples -- and which McGill calls "the golden standard." But it won't be just pies on the table; the menu also includes Southern Italian small plates, antipasti, and "stuff that's fun to eat with your pizza," McGill says, referring to some seafood cameos like clams and octopus. A dozen pizzas are in rotation, with seasonal produce and charcuterie from McGill's pigs showing up across the menu. If you're familiar with McGill's other institutions, you certainly won't be disappointed by this one. Each time the chef opens something new, he handles everything from overseeing design and managing permits to driving a flatbed across town to pick up a deli case. And that won't change, no matter how many more properties he adds to his kingdom. "Sometimes I think my multitasking management is a function of insecurity. As if every part of the process is so dependent on me," he muses. "But I really only know one way to do this, and that's my way. My only attempt at a restaurant partnership lasted about three months. So, I listen to the team, put authenticity first, and go with my gut." Seattle native Julia Wayne is a writer, content strategist, and UX designer. She’s a published author on sites like Sip Northwest, Cidercraft, Munchies, Extra Crispy, Us Weekly, AllRecipes, Eater, and more. She’s obsessed with tacos, Korean food, and cheese -- and once ended a relationship over differences in lactose tolerance.